Alongside big franchises such as The Expendables and Sin City, we can look forward to our fair share of indie gems released this month as the best of the film festival circuit continues to filter through to the mainstream. From Daniel Radcliffe’s alternative rom-com What If to fantastical French film Mood Indigo, there’s sure to be something a little bit different to tickle your fancy! So here, in convenient ‘release date’ order, we have the 11 best films to check out this month. Enjoy! Why Should You Watch It? Mood Indigo, or L’écume des jours, is a charming and dynamic French film from Michel Gondry, the director of Oscar-winning 2004 film Eternal Sunshine of the Spotless Mind. The romantic fantasy stars Romain Duris as the wealthy and inventive Colin, who desperately tries to find a cure for his beautiful lover Chloe (Audrey Tautou) after she is diagnosed with the unusual condition of having a flower grow in her lungs. The fantastical nature of the story is heightened by the incredible cinematography and show-stopping performances from the stars, this is definitely one to watch! To check out our Mood Indigo review, click here. Why Should You Watch It? The real question is, why wouldn’t you watch it?!? After the success of the E4 show that started back in 2008, The Inbetweeners took the UK by storm when they released their hilarious first feature film in 2011. When it was announced that a sequel set in Australia was in the works, the internet pretty much broke down with excitement. And with much of the plot kept firmly under wraps we are sure to be treated to many cringe-inducing surprises! Why Should You Watch It? Lilting is the heart-rending British drama, written and directed by Cambodian-born director Hong Khaou. Telling the story of a mother who is trying to come to terms with her son’s untimely death and how her world is turned upside down by the sudden appearance of his lover (Ben Whishaw), Lilting is set to be a heartbreakingly beautiful and poignant film. Together the two characters attempt to overcome their shared grief whilst struggling against their lack of a shared language. Why Should You Watch It? As one of the late Philip Seymour Hoffman’s final films, God’s Pocket is a must-see this month. Hoffman stars as Mickey Scarpato, whose crazy step-son Leon is killed in a construction ‘accident’. With nobody in the neighbourhood sorry that he is gone, Mickey tries to bury the bad news with the body but things go from bad to worse. Based on Pete Dexter’s successful novel of the same name, God’s Pocket oozes with impeccable talent with Mad Men star John Slattery making an especially impressive jump to behind the camera in his directorial debut. Why Should You Watch It? The action elite of Sylvester Stallone, Arnold Schwarzenegger and Jet Li, to name a few, return for the third installment of the franchise that pays homage to the classic blockbuster action films of the 80s and 90s. This time, Barney and his team come into conflict with a ruthless arms dealer who is determined to destroy The Expendables. Once again co-written by Sly himself, expect the usual action mixed with great humour. Why Should You Watch It? Simon Pegg + slightly out-there British comedy = a winning formula in our eyes! Pegg stars as an eccentric London psychiatrist who finds that he is no longer able to make his patients happy, so in a desperate bid to be the psychiatrist that people deserve, he searches the globe to find the secret of happiness. Based on Francois Lelord’s international bestseller of the same name and with an all-star cast, Hector And The Search For Happiness will be one of the feel-good films of the summer. Why Should You Watch It? Daniel Radcliffe is officially Harry Potter no more in this warm indie rom-com, where he plays Wallace – a medical school dropout who has been burnt by bad relationships. Zoe Kazan stars as his love interest who, despite her having a boyfriend, he has an instant connection with, which leads to them both wondering what if… Billed as the best indie rom-com since (500) Days of Summer, What If is set to deliver a unique take on the typical love story with a charming script, memorable performances and a brilliantly self-aware humour. Watch our video to see 6,500 people at San Diego Comic Con 2014 sing Happy Birthday to Daniel Radcliffe! Why Should You Watch It? Scarlett Johansson has certainly been busy of late with her 5th – yes, that’s right, 5th – film of the year released this month! This time Johansson plays the title character who accidentally gets caught up in a dark deal but manages to transform into a merciless warrior in order to turn the tables on her captors. Morgan Freeman also stars and the strong plot and A-list cast suggest that this is not one to miss! Why Should You Watch It? The second of Frank Miller’s neo-noir Sin City comic book series, A Dame To Kill For, is finally hitting the big screens and it will not disappoint! Returning to the miserable town of Basin City, the all-star cast become embroiled in even more conflict and corruption than in the first installment. Despite a cameo from none other than Lady Gaga, the most exciting star of the sequel is Joseph Gordon-Levitt, who is taking on the role of leading man Johnny. With a proven versatility and talent when it comes to acting, there is no doubt that Sin City: A Dame To Kill For will be yet another film that Gordon-Levitt touches and turns to gold. If that isn’t enough to convince you to see it then the 3D effects, unique colour processing, and the appearance of ultimate femme fatale Ava Lord – played by Eva Green – should certainly do the trick! Why Should You Watch It? Another popular release from the film festival circuit, God Help The Girl is set in Glasgow and follows Eve (Emily Browning), a girl who’s in hospital dealing with her mental health and starts writing songs to get better. With her passion for songwriting clearing her mind, it leads her to the city where she meets James (Olly Alexander) and Cass (Hannah Murray, or ‘Cassie from Skins’), two musicians who each faces a crossroads of their own. Set to a fun soundtrack, what follows is a dream-like summer that will warm every inch of your heart. Why Should You Watch It? The big-screen adaptation of Gayle Forman’s young adult novel, If I Stay has been highly anticipated for a long time, and now it’s finally here! Chloe Moretz stars as Mia Hall, a 17-year-old girl who appears to have it all: a loving family, doting boyfriend, and a musical gift. However, when tragedy strikes, Mia has an out-of-body experience and is left to make the hardest and most important decision of her life. Poignant and heartbreaking, have the tissues at the ready for this one! 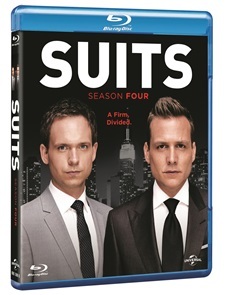 WIN SUITS SERIES 4 on Blu-ray™!